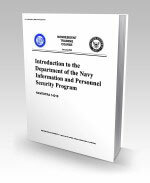 14210.pdf - Pages: 82 - 14210 Introduction to the Department of the Navy Information and Personnel Security Program - Provides a basic introduction to the Navy's Personnel Security Program, as set forth in SECNAVINST 5510.30A and the Navy's Information Security Program as set forth in SECNAVINST 5510.36. The first five assignments cover personnel program policy and management, including requirements for access to classified information and security education. The last six assignments cover aspects of the information security program, including classification management and the industrial security program. 14222.pdf - Pages: 216 - 14222 Information Systems Technician Training Series, Module 1, Administration and Security - Provides information on the duties and responsibilities of the Radioman as they relate to automated information system (AIS) administration, communications administration, communications security, AIS security, and general security. 14223.pdf - Pages: 146 - 14223 Information Systems Technician Training Series, Module 2, Computer Systems - Provides information on the duties and responsibilities of the Radioman as they relate to computer hardware startup, computer center operations, and data management. 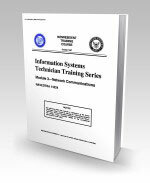 14224.pdf - Pages: 76 - 14224 Information Systems Technician Training Series, Module 3, Network Communications - Provides information on the duties and responsibilities of the Radioman as they relate to network administration, local area network (LAN) hardware, and network troubleshooting. 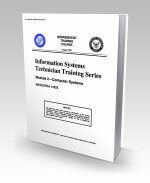 14225.pdf - Pages: 92 - 14225 Information Systems Technician Training Series, Module 4, Communications Hardware - Provides information on the duties and responsibilities of the Radioman as they relate to communications hardware and satellites and antennas. 14226.pdf - Pages: 96 - 14226 Information Systems Technician Training Series, Module 5, Communications Center Operations - Provides information on the duties and responsibilities of the Radioman as they relate to center operations, voice communications, emission control, and cryptosecurity.